Published February 3, 2016 at 200 × 267 in Straight Talk on Vocal Tremor. 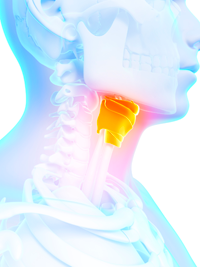 The larynx (highlighted in the illustration above) is an organ in the neck involved in breathing, sound production, and protecting the trachea against choking on food. It also manipulates pitch and volume. The larynx houses the vocal folds (vocal cords), which are essential in making sounds. The vocal folds are situated just below where the throat splits into the trachea and the esophagus.